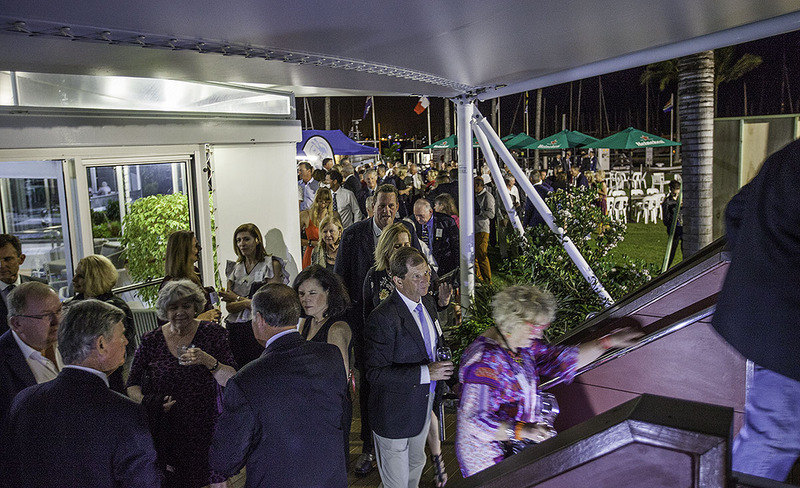 Ordinarily you might expect a big bash after a major regatta. Especially one where there is a weigh-in before, and then another halfway through the main festivities. 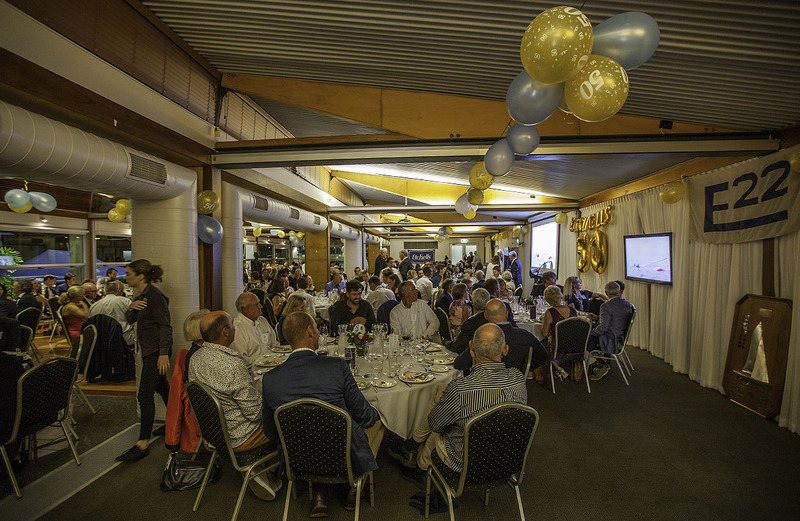 Yet on the eve of the super-well attended 2018 Etchells World Championship being staged out of the Royal Queensland Yacht Squadron (RQ), this was a party that not only had to happen, it cemented do much about what this preeminent of sailing classes is all about. Namely superior competition on the water, and then marvellous camaraderie once back ashore. 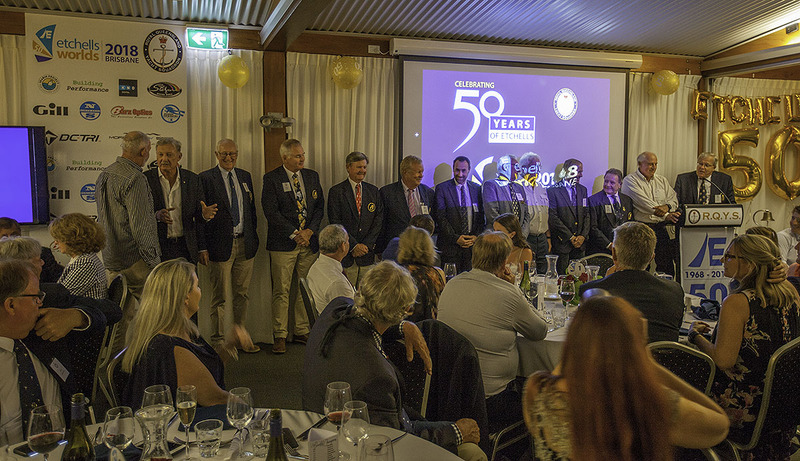 Now the reason for such a marker to be placed in the annals of history is that it is 50 years since Skip Etchells created the very vessel now so revered around the globe, and the one that attracts all manner of sailing superstars to her ranks. Yes. It was a birthday party fit for a milestone of this nature. Naturally there was one discussion amongst the 245 invited guests that completely filled RQ’s marvellous facility. So yes, the boat and all her many nuances were firmly established, just as her standing as the One Design class around the globe. However, with such a venerable craft and a gathering of Olympians, World Champions, and stars of sailing’s pinnacles in the America’s Cup and Round the World races that would be hard to surpass, it would be the myriad of back stories that one would find inspiring and captivating. Certainly then, you would expect it to be an emotional occasion, and it was. Some received their Etchells pockets for previous World Championship wins, and the class itself celebrated with a cutting of the cake. Yet for me it was probably all about three things. The first would be some of the new inductees to Life Membership of the International Etchells Class Association in Kers Clauson and David Ritchard, along with one man deeply rooted to the class and this particular fleet, Noel Paterson. Part of acknowledging the efforts of some great sailors over the journey was given to long time Governor, David Ritchard, who awarded his friend, David Healey with a pin to celebrate his hard work and service to the Australian Fleet, and so mark his passage to Life Membership of the Australian Association. David Ritchard held it together, just, and nearly brought many others to tears as well. Typically, the quietly spoken David Healey was ultra-gracious as he thanked all in attendance for his time in Etchells, which is by no means over, for he is out on the racetrack today. The second would be the number of sailors under 40 both in attendance on the night and as part of the 95-boat fleet racing in this amazing championship. Some are even former Etchells World Champions, as well as owning other accolades. This is quite incredible, and goes some way to highlighting how the class is moving forward to a big future, and not sailing off over the horizon to be given a Viking funeral. The third item was when John Bertrand AO was given the floor. As always he captivated and inspired, humoured and was poignant. He called on some other legends, like Michael Coxon and Steve Jarvin to regale tales from other campaigns when they all sailed together. Some of which cannot be written about, but will now pass into folklore. Yet the final item before we close is one that probably shows the love the class best. John asked all those who had been to five Etchells World Championships. It was a lot of the room. Then he asked those to sit down who had not made ten yet. It went on to 15, 20, 22 and so on, until it got to just the two souls, and at 24 it left just Bill Steele standing. He is at his 28th, by the way.